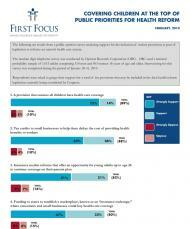 Children are at the top of the public’s priorities for Congressional health care reform efforts. This national survey gauged public support for ten leading provisions being discussed as part of a final health reform bill. The results find that, while all ten reform elements tested remain popular, “a provision that ensures all children have health care coverage” received the highest level of support, favored by 89 percent of respondents.